In 2013, we ran two posts where Lindsay Rattray explained the opportunity he saw in bringing together the pedagogy of ELT and the power of inter-connected mobile technology. His startup, ClassWired, was a way to do student-centred ELT activities in class. It was web-based, so designed to work on any device. It gave you information about your class, such as how fast your students are working, and what they are finding difficult. In fact, Lindsay was an early ELT Entrepreneur, asking questions and looking for answers from an ELT teaching and EdTech perspective. Picking up his story almost two years on, it’s interesting to see how the questions have changed, fundamentally. This is more than pivoting. But let’s let Lindsay explain. I’ve decided to take a step back from ClassWired. Why, you ask? Well, the fundamental reason is a kind of ‘we had artistic differences’ of the EdTech world. Basically I need more time to decide which part of the learning process I’d like to interfere with. The best part of the DELTA, Module 1, is the one that gets you to look at materials and answer this question: ‘What are the assumptions about learning behind this?’ Answers range from ‘group work enhances learning’ for peer-work tasks, to ‘learners need a record of language’ for guided discovery tasks. It sounds simple but it takes some skill to tease out what beliefs about learning underpin the material we use every day. In EdTech, I think that question – although still valid – should be adapted. My question is: What part of the learning process are you trying to abstract into a piece of technology? In other words, what are your assumptions about which parts of the learning process are regular or repeatable enough to be extracted into a standardised* information system? (*Even adaptable learning materials are part of systematic learning mechanism). 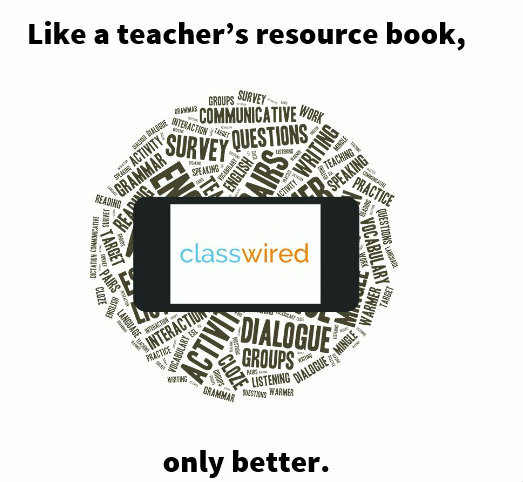 At ClassWired, we abstracted classroom interactions. I believe that the teacher can learn more about their class by viewing students’ work while they work, and receiving key data about how they are working. Knowing more about your class helps you personalise the learning. We built activities, like brainstorming and explain-the-word-to-your-partner, and they worked better in my classroom than they did without the app. Duolingo, to take another example, is a poor abstraction of the entire language-learning process. It makes out-dated assumptions about the learning process. However, as a language extender – in other words abstracting the supplementary materials part of the learning process – it may work quite well. Flovoco, made by our friends at ELTjam, tries to abstract vocabulary learning. This does not produce the same dissonance as ClassWired (perhaps making it less disruptive?). We can debate whether vocabulary learning is truly separate from language learning, and then there’s the issue of learning discrete items versus chunks, etc. … but no-one would argue that learners don’t focus some of their learning time specifically on vocabulary. Which is why vocabulary learning apps are a more crowded market. To help me think more about this, I have decided to do a Masters of Learning Sciences and Technology at Sydney Uni. Wish me luck. If I’ve got time I’ll share what I learn. In the meantime, what do you think? Are my instincts correct here? Should I be so doubtful or should I stick tight with the original vision? Lindsay is a former programmer and business analyst who migrated over to ELT. He did this because, while studying Arabic in Syria, he realised how much technology could improve our classrooms (just not the pedagogy-less stuff that was being made at that time). He became a teacher to get the teaching skills and knowledge needed to make this happen, and now he’s (slowly) putting it all into practice. Photo Credit: ed_needs_a_bicycle via Compfight cc. Text added by ELTjam. I was waiting for another post from you and I wasn’t disappointed. Thanks for the update. 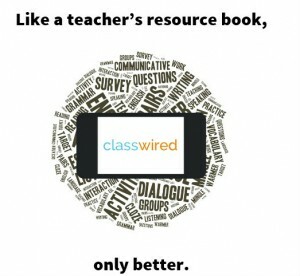 It sounds like Classwired has been a great success in terms of what you learned. 1. You asked about interaction patterns. Could you give us a definition of this term? 2. You told us you abstracted these patterns. Could you explain what you mean by this term. Do you mean modeled? 3. Could you give us an example of an interaction pattern that you abstracted? 5. If i+1 describes the learning process, how do interaction patterns impact this simple equation (amplifies/inhibits)? 1. Definition of interaction patterns: At their simplest, Teacher-Student, Student-Student. At their more complex, 2 Students – 3 Students then Teacher – Whole Class. Hard to map this stuff in software. 2. Yes I mean modelled. 3. I abstracted brainstorming, ie Student-Whole Class, Student-Group, and Group-Group. It was very hard to figure out what should happen to one student’s data if they change group! 4. Shouldn’t we be looking for which “interaction” patterns have the greatest positive impact on learning? (see Visible learning for Teachers for how teaching effects learning) Yes, we should. 5. If i+1 describes the learning process, how do interaction patterns impact this simple equation (amplifies/inhibits)? They’re one tool at the teacher’s disposal, especially important in communicative classes with co-constructed meaning. I am curious what you captured during these interactions and how you wanted to use this information. We’re the patterns of interaction more important than the content? Interaction pattern: Student->Group->Class (so a student can see their group’s brainstorm, and the class (ie teacher device) can see everyone’s. The content and the interaction patterns aren’t more or less important than each other, just different aspects of what’s happening. Now imagine you want to re-share those words with students, one at a time, so they can explain each word to their group. Maybe I am showing my ignorance here but when you say brainstormed what exactly do you mean? What is the end product? Are you looking for a way for a class to comment on its own output? Doesn’t this answer your question? A brainstorm doesn’t have to be a class commenting on its own output, the content of the brainstorm could be anything. Eg think of things you might see in a cafe, things you might say at a party, ways to interrupt someone. Brainstorm: any attempt in class by the student(s)to ask or answer questions related to the meaning of or the use of vocabulary words. Interaction patterns: any spoken interaction between individuals in the class. Interaction patterns can be categorized by the number of people involved in the interaction. Interaction pattern: Yes, think of this as T-S, S-S, T-Ss, etc that you see written next to lesson stages in a lesson plan. At first to me it sounded like brainstorming was confined to a process of group reflection (which would include asking questions). Now, it sounds like brainstorming is the equivalent of “unregulated talk”. I am just curious “what” you are attending to (writing down for purposes of analysis). I am also curious why you asked above if there are TOO many interaction patterns? Too many for what? You also asked how many there are. Is the number of patterns difficult to count? Or are you saying that it is not the patterns themselves that are difficult to count but rather the actual instances of the pattern occurring in a classroom? I also pay a great deal of attention to groupings in the classroom. I have observed that the nature of the conversations in class change depending on how many students participate in a “group” conversation or task. Groups of 2, 3 and 4 all interact differently. In a Chinese speaking environment. I personally think the sweet spot of complexity and mutual support happens in 3-person groups. I am unaware of any research that correlates group size with language learning results or even fixed patterns of speech. Is this one of your goals? When you talk of abstracting these patterns to devices it really gets my attention but I am still unsure of what you are actually trying to abstract. Also when you criticize Duolingo I wonder if you actually mean that they have done a bad job abstracting learning done in the classroom. Finally, I wonder if the best, most effective language learning is NOT done in interaction with others in a class but instead takes place alone, when one is working with a book, a tape, or a video. In others words, might the most effective language learning interaction pattern be self-to-self which Duolingo could be very good at abstracting?